The workshop to take to make fast progress in watercolor painting. This three-day intensive was developed especially to address the most common problems for those learning to paint in watercolor. You’ll learn how to strengthen your paintings with loose, flowing, transparent washes and important basic composition ideas. Day 1 – “The water’s great – dive right in!” – The most important element of watercolor is … water! It’s the key to loose flowing washes, subtle minglings and for maintaining transparency. We’ll learn to use and manage it to best advantage. Important techniques – Wet-into-wet, dry-into-wet and edge creation – will be covered. Day 2 – “Think ahead” – Watercolor is not easily fixed, so planning for success is imperative. We’ll cover simple principles for powerful designs and explore ways to create dynamic shapes, while learn to employing color and value for maximum effect. Day 3 – “Composition is King” – Creating any painting, of any subject, is actually an exercise in arranging design elements on our paper in a powerful, pleasing way. We’ll cover simple composition arrangements that result in strong paintings every time. By the end of the three days, you’ll have all the tools needed to successfully paint in watercolor. March 29 – 31, 2019, 9am – 3pm each day. Workshop meets at Taraden, 183 Park Street, North Bennington, Vermont. Class fee – $295. Suggested Materials: I recommend a basic set of watercolor materials for this class. Download from my website using the link below. March 29 – 31, 2019, 9am – 3pm each day. 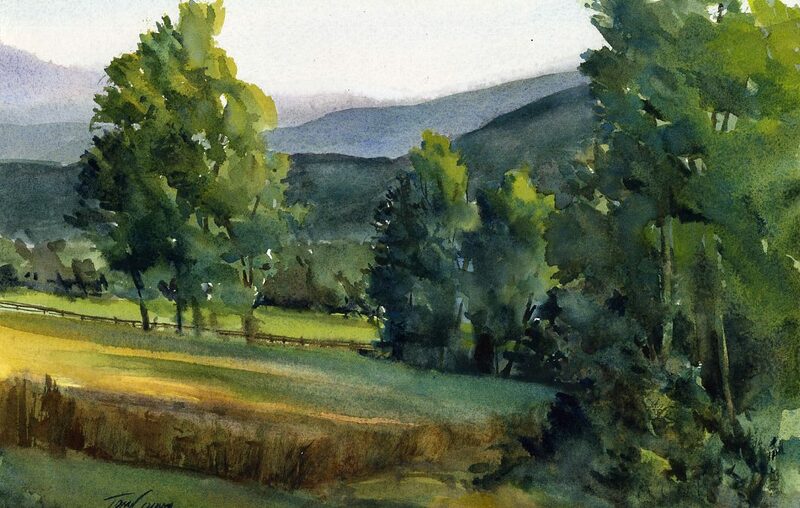 Tony Conner is an accomplished watercolorist and and experienced instructor. His energetic approach to teaching and enthusiasm for the watercolor medium are combined to create classes that are both fun and informative. He excels at providing information and insights to individual students – meeting them where they are and helping them get to where they want to go. Tony works from his studio in Bennington, Vermont.